Don't think of your Persian violet, or Exacum affine, as a long-term relationship. Instead, think of it like a favorite uncle that drops by for the holidays or a college roommate you had for one semester before they transferred to a better school. In other words, it won't last long, but you'll love it while it does. 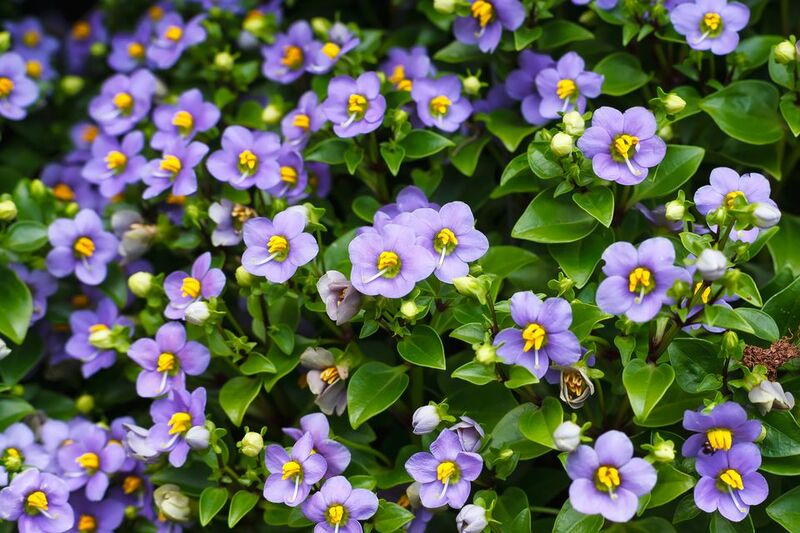 Unusual among houseplants, the Persian violet has a great mounding growth habit that will brighten up any surface and obscure its planting container. They also have a delightful fragrance that will lighten up your room. For best results, buy a plant that has many growth points and is loaded with unopened buds. Although it might seem like it lacks color, you'll be happy three weeks later when the plant is in glorious bloom with bell-shaped, light purple and blue-lavender colored flowers each less than an inch wide. Light: ​Provide bright indoor light, but not full midday sun. They love southern or western exposures where they can get late-afternoon strong sunlight. Be aware that the more light they get, the more water they will require. Water: Persian violets are actually related to impatiens rather than violets and have all the same water requirements: more and more. Keep the soil continuously moist, never allowing it to dry out. In drier homes, mist weekly to increase ambient humidity. Fertilizer: Feed weekly with a weak liquid fertilizer that includes micronutrients and encourages blooming. Do not use controlled-release fertilizer as the plants tend not to live very long and you'll do better with liquid fertilizer. Soil: A light, fast-draining potting soil is perfect for Exacum. You can use fortified soils. Most plants in garden centers are started by professional growers from seeds. If you find Exacum seeds, you can start you own under a typical seed-starting set-up. Otherwise, considering their short viable life, it's not usually worth it to attempt propagation. It is possible to start plants from stem-tip cuttings with rooting hormone, but the success rate is fairly low and you'd be better just buying a new plant when you see one available. Most Persian violets won't live long enough indoors to require repotting. However, many people find that the plants they buy in garden centers are already root-bound before they arrive home. Plants in this condition will grow more slowly and bloom less vigorously than their free-growing relatives. It's recommended when you buy a new plant to lightly pop it out of its container and look at the roots. If they are circling the pot and there is not much soil visible, it's root-bound. In this case, gently air out the roots and pot into a larger container. The main species is Exacum affine, but there are several varieties available. Choose your plant based on its flower colors. Although most are purple, they are available in deeper shades of purple or white. The Persian violet is a beautiful and lovely houseplant with a very light, even fleeting fragrance. It will enhance any sunny sill you can find it. The main problem with Exacums is water control. They are very prone to lack of moisture and will readily wilt if they are thirsty. On the other end of the spectrum, however, they are also vulnerable to root rot. If your plant persistently wilts even though you're watering it faithfully, check the roots to see if they are rotted or unhealthy. If so, the plant is probably beyond saving and you'll have to discard it. Be aware, however, that they also drop buds when they are shocked, so it's not uncommon for a plant to lose some blooms when it first gets home. Finally, they are susceptible to aphids and spider mites, so look for signs of infestation, including webs on the undersides of leaves and crinkled leaves. If you see plants, treat accordingly. If you buy the plant in the very early spring, you can move it outside in temperate areas as a lovely patio or deck plant.